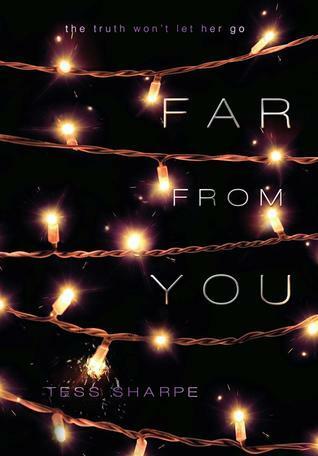 I wanted to read Far From You because even though I am not always drawn to mystery whodunnit type thing, I am drawn to the medical. So, the idea of Sophie almost dying twice and the pain pill aspect really drew me in. Besides, I really like the cover although to me it gives it more of a romance feel instead of girl who lost her best friend and finding the killer slash girl who deals with pain and of recovery. I connected with Sophie, because she had an authentic, in pain voice. She is trying to deal with all of the hard things life has thrown at her, hoping to find a killer who the police have given up on, learn to recover from pill addiction, pain from her first accident, and on top of that, she has parents who don't believe that she was clean on and before that night. The time jumps got to me a bit because they are so often, but it does make its own sense in piecing together the story and getting a full picture of who Sophie is as well as the wonderfully crafted thing that was her friendship with Mina. It had a bigger part in the book that I could have imagine, but it only brought it to life even more. I wasn't expecting the LGBT aspect of this story, and I didn't mind it, but if you are against that sort of thing, just know that its there and I don't think that they really advertised that well. I think that the love triangle, square, some weird shape in this one was the most unique that I have ever read, and it makes the most sense because of how it happens and the feelings in it. I wasn't really expecting who the killer was, I had a few suspicions, but they weren't exactly right. But, I am not one that can usually guess. I liked Trevor, he was so sweet, and I wished that things could work for him. He is Mina's brother, which only adds that layer of complication. But I so admired how strong he was, and how good of a friend that he was to Sophie. It was so obvious that he was in love with her, but he put that aside to be her friend too and that said so much about his character. The friendship and relationship between Mina and Sophie was forged over so many years, and it was the kinds that loved the flaws, never being blind to them, but pushing and helping the other to be better, and to rise above. I could feel the grief from Sophie, how much that she missed Mina and how hard she struggled that she saw it, and that her friend will never be by her side. While I understand why she took some of the investigation on herself and her friend Rachel and eventually Trevor and another unexpected ally in it all. I also couldn't believe how reckless she was at times. But then again, she is surrounded and blinded by the fog of grief and the drive for some sort of revenge. The way it was woven in with the disappearance of the other girl was interesting, though as time I did get confused because it focused on her disappearance more so that finding the killer of Mina, although they are so entwined since we find out that Mina was investigating and must have gotten too close. The ending was good, and I think that it wrapped everything up well, and in some aspects, you can't really have an HEA with this type of story, but you can have satisfaction and a sense of completion. Bottom Line: Solid mystery with interesting take on doing the romance. Glad to hear that the ending was satisfying even with the lack of a HEA, but I agree, in this case it has more to do with the genre than anything else. Sounds like a good read. Great review! Indeed, the age of most protags don't allow, but pretty unique with her previous injury she is still living with. Mina and Sophie sounds really good. I have a copy of this, I need to read it soon. Their friendship was really good in the flashbacks. Intense. Obviously there's a lot of going on in the background that prompted the heroine to do what she did. The psych aspect alone is worth reading this book for. Tough subject matter and I applaud the author for tackling this growing problem. Even though you don't quite get the HEA I am glad it ended well for you. Glad the author did bring up this subject matters as well, especially in this day and age. I didn't know it had an LGBT aspect in this story but I think that's pretty awesome. I know some people are sensitive about it, but seeing it more and more in books makes me happy. I haven't read a lot of time jumps and I confess I'm so curious to read more iof it! Brandi, Far From You sounds like a beautiful, yet mysterious story! You got me very curious with your review, and now, I know I have to read it! Both Sophie and Mina sound like great characters, even if I guess we learn more about Mina after her death. I don't think I've read any stories where the main character is addicted to pain killers - and I think it helps make me even more intrigued that there is this aspect here. I am so glad I read your review, I have this from publisher and didn't realize how much more this was! I will read it this week! I've been seeing some good reviews for this book :) I'm glad you enjoyed it! Sounds like a pretty good book. Happy you enjoyed it and I do like a good mystery. I didn't know this had LGBT elements, that makes me want to read it more. I wasn't interested before but now I'm thinking I definitely want to try this! Great review! This one sounds like a unique read, filled with some intense elements. Glad you enjoyed it!! And wonderful review! Glad to see that the story was more than just a mystery whodunnit type of thing. Sophie seemed like an interesting character and it was sad to see that her parents didn't quite trust her. Thanks for sharing, Brandi! This cover reminds me so much of Uses for Boys. I didn't know much about this book, but the mystery and romance sounds good. I'm glad you liked it! this does sound really interesting- I'm glad to hear you liked it. I didn't know about the LGBT thing either but it actually makes me more interested in reading it. Changes things up. Yay! A winner ;) And this one is definitely going on my TBR list. Wonderful review! Love your question, totally reminds me of a few stories my parents told me about when I was younger and they probably should have been paying more attention to me. Specifically when I was in one of those toddler bikes and the door to the stairs was open. Anyway! I've seen a lot of mixed reviews for this book but I'm glad that you liked it. The characters sound great and yeah, the LGBT part is definitely news to me! The cover doesn't seem to make much sense in terms of what the story is about, I agree. I like it, but seems to romance-y! The time jumps might be an issue for me. I had a hard time with SIDE EFFECTS MAY VARY for that very reason, but I'm definitely giving this one a shot. It seems like all books like this make the main character reckless at times. But I guess that comes with the territory of a teenage trying to solve a major crime by themselves. So glad that the actual killer remained a mystery! I hate when I can easily guess it. Looking forward to reading this! I really enjoyed this one! I went in expecting a generic mystery, and thought the book was so much more. I agree that the romantic part of the story was somewhat tragic and complicated, but also that made the book unique. I definitely recommend this book for readers who are looking for something different in YA contemporary. So glad you enjoyed this one. I haven't had a chance to read it yet but it sounds really intriguing. Definitely eager to read it!! I must admit the premise is intriguing and I'm a little scared to read it, especially since I am an emotional reader.